This post covers what happened in Decred in the month of February. 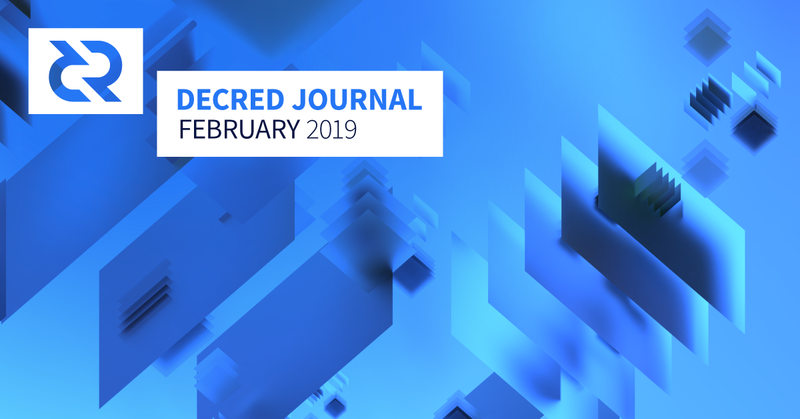 It is the 11th issue of the Decred Journal and you can find the original post on GitHub. Past issues are available via this GitHub link. Happy Birthday, Decred! Three years passed since the first block was mined on Feb 8, 2016. February has seen a lot of Politeia activity with 7 proposals submitted, 5 started voting and 4 passed on the first days of March. A total of $490,000 of marketing and events budget for the remainder of 2019 was formally approved by the voters. The network has sufficiently upgraded for the consensus vote necessary to fully support Lightning Network, projected to start on Mar 14. For everyone not upgraded yet, v1.4.0 release contains a lot of improvements and will be required for nodes to proceed on the upgraded chain in case the vote passes. As always, verify the binaries and tell friends to do the same. dcrd: mempool policy tightened by allowing one less double spend of a ticket and rejecting same block double spends. Wallet-specific types removed from dcrd and moved to dcrwallet where they belong, this simplified changes to dcrwallet and also triggered refactoring in dcrd to provide stronger module boundaries and simplify the dependency graph (note how the pull request cares for reviwers). Non-root Go module replacements were removed — this helps to ensure that latest code from all modules is being tested, and to keep them independently accurate for external consumers. dcrwallet: v1 ticketbuyer was removed after being deprecated for several releases. Decrediton: upgrade to Electron 4 allowed to make startup on Windows more robust. Added exit alert when ticketbuyer is running. Design phase for multiple responsive views is finished and ready for implementation. Politeia: new features are highlighting of new comments since last visit and email notifications after password change (suggested via bug bounty program). Epic cache layer work was merged! Thanks @lukebp and all reviewers/testers. This paves the way for a lot of site performance enhancements. Among other completed work are CLI tool improvements and fsck (file system verification tool) for dcrtime. Work started to scale www database using CockroachDB. A decision was made to move the code for contractor management system to politeia and politeiagui repositories to avoid the overhead of maintaining two codebase forks and keeping them in sync. Change of the default comment sorting algorithm is being discussed. dcrandroid: many bug fixes and minor improvements are lined up to be merged, see project board for detailed progress. Chinese and Vietnamese translations are in progress. dcrios: TestFlight beta was updated and work is ongoing to bring it up to par with dcrandroid. Progress can be tracked on this board. First release candidate is planned in a month, and there will likely be a point release to dcrandroid then as well. dcrdata: added feature to show data about Politeia proposals, added fiat conversions (supply, treasury, ticket price), mempool page rework, endpoints to get raw blocks and raw headers, added cache package. Discussion started how to calculate cost of 51% attack on dcrdata. Ticket splitting: @matheusd shared his position, some background and plans for ticket splitting. @david recorded an instructional video that walks through the setup. docs: new page explaining Politeia Censorship and how to prove you’ve been censored, new Upgrading Decrediton page, list of testnet VSPs added to Using Testnet page, P2PKH address generation flow diagram added to Address Details page. The search is back. decred.org: content and translations updates. Implementation of the News and Posts page started. First results of the bug bounty program: as of Mar 3, a total of 27 reports were submitted of which 2 are vulnerabilities eligible for payout ($72 and $90). Interesting detail from @matheusd’s blog about DCP0004: Decred’s PoS component can serve as an extra protection from unintended consensus bugs. voting.decred.org dashboard now shows past agendas too. jQuery was removed to the delight of those who understand. Replacement of Google reCAPTCHA with self-hosted solution was merged — huge step in improving stakeholder’s privacy. Thanks to all developers and testers of this patch. Trivia: did you know that Decred heavily discourages creation of dust outputs? PoC UI for atomic swaps made a few steps. QTUM support merged in atomicswap, POLIS support removed. Work started to add DNSSEC support to dcrseeder. authit, the UI for dcrtime is now hosted at timestamp.decred.org. Feedback is welcome in GitHub issues or in the new #timestamp chat room. Dev activity stats for February: 251 active PRs, 224 master commits, 39K added and 24K deleted lines spread across 8 repositories. Contributions came from 3–8 developers per repository. These stats cover only the most active repositories. Welcome to new first time contributors with code merged on GitHub: @jozn (dcrd), JoeGruffins (dcrwallet), luoshang722 (atomicswap), rex4539 (dcrdocs). 1 contributor removed from decred.org: Jure Kralj (@praxis, Reddit manager). In February the Treasury received 14,878 DCR and spent 17,311 DCR, making it the first month with negative net total. Using February’s daily average DCR/USD rate of $16.51, this is $246K received and $286K spent. As these payments were for work completed in January, it is also informative to consider them in the context of the January average daily rate of $17.06 — in which case the USD received/spent figures are $254K/$295K. As of Mar 9, Treasury balance is 605,828 DCR (10.05 million USD at $16.6). Baeond card game by burst was rejected by 97% No votes of 29% participated tickets (missed in Jan issue). Decentralized exchange RFP by @jy-p received 82 comments on Politeia, 11 comments on Reddit, and 2 revisions that reduced the scope of the MVP and capped the cost at $250K (down from $1M). @bee published a personal pros-cons analysis. The proposal also spurred a discussion about whether the Treasury should fund promotion of proposals like this. Voting started with 91.4% Yes out of 8K votes as of Mar 9. Wallet tutorials by Denni Lovejoy of Cryptocurrency.Market was published after multiple iterations and feedback collection in chats and Reddit. The budget of $750 was approved with 80% Yes votes and participation of 24% tickets. Events funding for 2019 by @Dustorf was submitted after previews in chat and Reddit. Voting finished with the approval of a $200K budget by 89% Yes votes with 34% tickets voting. Marketing funding for 2019 proposal by @Dustorf was extensively discussed in 68 comments, in addition to chat and 44 Reddit comments preceding the proposal. The budget of $290K was approved by 83% Yes votes with 36% of tickets voting. Decred ATM integration proposal by @oregonisaac is a result of many weeks of research, drafts and feedback since the discussion of Bcash ATM proposal in Nov 2018. Current proposal asks stakeholder opinion whether to proceed with planning. If approved, another proposal will be submitted with particular details of implementation. Voting not started. Decred community website by @karamble proposes a website that aggregates multiple sources of Decred-related content like articles, videos, podcasts, event reports and merchants. The prototype was already built by @karamble and the proposal seeks $6K to fund the site for 6 months. Voting finished with approval of 72.5% Yes votes, with votes by 33% of eligible tickets. Decred integration for IDAX exchange by acean seeks 1,000 DCR to add DCR/BTC trading pair to the IDAX exchange based in Mongolia. Voting finished and the proposal was rejected with 25% Yes votes, with 23.5% of tickets voting. Decred integration in Trust Wallet by @oregonisaac proposes to integrate Decred into “fully decentralized” Trust Wallet for approximately $3,300 and $100 monthly support. Voting not started. 7 new proposals submitted, 5 proposals started voting. 300 comments on Politeia proposals from 46 different users (public keys). 1,006 up/down votes on comments from 56 different voting users (public keys). 748 upvotes (70%) and 258 downvotes (30%). 802 comments on Politeia proposals from 113 different users (public keys). 2,785 up/down votes on comments from 122 different voting users (public keys). 2,336 upvotes (80%) and 449 downvotes (20%). There are 32 users who voted on comments but never commented, and together they have cast 374 votes (13.4% of total). Around 238 comments (30%) have been upvoted by their author. Thanks to @richardred for automating the generation of the above stats. Discussion started to amend Decred Constitution and ratify the new version with a Politeia vote. The initial goal was to remove outdated/irrelevant parts and add missing parts with minimum changes. During the discussion several people asked if we need constitution at all, considering that it is not binding. Links to all discussions and proposed changes are collected in this issue. A new @pi_crumbs Twitter account notifies its followers when proposals are created or modified, and when voting starts or finishes. Currently operated manually by @richardred, but automation is discussed. Another account called @slices_of_pi posts commentary on Politeia activity written by a human. For greater detail, analysis and commentary see @richardred’s excellent Politeia Digest issue 10 and issue 11 which the above summary is based on. Hashrate: February’s hashrate opened at ~230 Ph/s and closed ~300 Ph/s, bottoming at 210 Ph/s and peaking above 420 Ph/s throughout the month. Pool hashrate distribution as of Mar 5: BTC.com 31%, Poolin 27%, F2Pool 18%, UUPool 15%, Luxor 4%, CoinMine 1% and others are 5% per dcrstats.com. Pool distribution numbers are approximate and cannot be accurately determined. Staking: 30-day average ticket price was 111.6 DCR (+2.2) on Mar 1 per dcrstats.com. The price varied between 98.4–124.1 DCR. Locked amount was 4.36–4.56 million DCR, which corresponded to 46.4–48.7% of the available supply. Ticket price and pool size experienced some volatility in February. 1,265 tickets purchased in a single interval on Feb 11 raised the pool size to ~41,670 tickets and the price to 119.4 DCR in 7 subsequent increases. This was followed by a streak of 10 price reductions down to 98.4 DCR, when the pool briefly dropped below 40K tickets (last time this happened in Oct 2017). At the bottom, a stunning 2,797 tickets were purchased in a single window, out of a maximum possible 2,880. @ImacallyouJawdy noted that in this window alone 282K DCR or 3% of current supply was locked in tickets. As a result, the ticket price jumped to 124.1 DCR which is a new all time high since the deployment of the new stake difficulty algorithm in Jul 2017. Ticket pool topped at 42,174 tickets when 48.7% of the DCR supply was locked — a new all time high and +0.7% from previous peak on Jun 7, 2018. Thanks to charts.dcr.farm for the sharp charts. Nodes: As of Mar 1 there were 205 public listening nodes and 297 normal nodes per dcred.eu. Version distribution: v1.5.0 dev builds: 8.6% (+4.3%), v1.4.0 final: 43% (+43%), v1.4.0 dev and rc builds: 7% (-6%), v1.3.0: 23% (-32%), v1.2.0: 10% (-4%), v1.1.2: 4% (-4%), v1.1.0: 2% (-1%). Upgrade thresholds for PoW and PoS were met and the consensus vote locked in to start around Mar 14. Thanks to everybody who upgraded their nodes, and also to people who reached out to PoW pool and VSP operators via different channels and asked them to upgrade. The vote did not start yet but block votes already signal their choices for fixlnseqlocks agenda. As of Mar 4 there were 8,503 Yes and 1 No vote. “Dat contrarian… At least it’s proof that the no button works.” - @jz. VSP codenamed “Bravo” was renamed from dcr.stakepool.net to dcr.blue. Vertbase added DCR/USD pair. Vertbase CEO and cofounder Justin joined #general and answered questions. Among the answers were: Vertbase supports 39 of the 50 U.S. states, is actively working to add GBP/EUR/AUD trading, and uses 3rd party to handle ID verification. An interesting feature of Vertbase is very short duration of custody: they will send tokens directly to your wallet once bank transfer settles. As of Mar 8, sell orders are not available. See also this Reddit post. Lykke added DCR pairs with BTC and USD. Livecoin added DCR pairs with BTC, ETH and USD. BitMesh launched DCR pairs with BTC and USDT. Warning: the authors of Decred Journal have no idea about the trustworthiness of any of the exchanges above. Please do your own research before trusting your personal information or assets to any entity. CoinFund announced Grassfed Network, an initiative that uses ‘generalized mining’ to directly participate in decentralized networks. The story was featured in CoinDesk. Any activity that is compensated with on-protocol rewards denominated in network assets can be seen as generalized mining. Following this approach investors can directly engage in the networks and generate additional returns, compared to just speculating on the value of assets. Per the announcement, CoinFund partnered with Placeholder who plans to delegate its own voting tickets to the Decred VSP launched in January. This plan was voiced earlier by Joel Monegro and Chris Burniske during the panel at Texas Bitcoin Conference 2018. CoinFund is a cryptoasset-focused investment and research firm founded in 2015 and based in New York, USA. In February, @Dustorf proposed his plans for marketing and events for the remainder of 2019 and these were passed by stakeholder voting. This is an exciting development that further decentralizes Decred by shifting more direct control over spending to the stakeholders. There was vigorous discussion and many good questions, but the proposals were approved by 83% and 89% of tickets that voted. With an approved budget, work began in earnest on the scope of the proposals. Planning is underway on NYC Blockchain Week, which coincides with Consensus. More information should be announced within two weeks on these plans. The first podcast is underway and scheduled to deliver in March. It will feature Decred Jesus, who will provide a colorful overview discussion of Decred as seen from the ground. Work on the website is underway, with architecture, copy-writing and video scripting already begun. The Decred Assembly and the newsletter are tactics we hope to deliver by the end of this month. Media trained 5 Decred community members. Secured media coverage: 15-minute interview between @jy-p and BlockTV, a feature article for the DEX proposal in Forbes, a feature article in honor of Decred’s 3rd anniversary in Breaker Mag, an article on the Vertbase listing in The Block Crypto featuring quotes by @jz. The journalist, Frank Chaparro, said the story was very popular on Twitter and also internally at The Block. Facilitated 2 interviews with crypto media outlets. Worked with the community to create a repository of media-friendly images that we can share with reporters to add visuals to stories about Decred. Helped plan the logistics and content for the event hosted by Decred and OKCoin in San Francisco. Worked with Dustin and OKCoin to draft the Eventbrite copy, coordinate with OKCoin, develop the agenda for the event, and draft a press release. Put together a plan to position Decred as a superior store of value among a variety of channels, including initiating long-term conversations with select top tier mainstream reporters. Worked with Dustin on a master six-month marketing and communications plan spanning PR, events, content, etc. As part of this strategy, we aim to build Decred’s legitimacy and credibility among institutional investors. That entails thinking beyond media relations to span other disciplines as well: owned content, Twitter, influencers, events, etc. For more detail see Ditto’s biweekly updates on Feb 4 and Feb 15. Long chat about perception and framing was triggered by a question whether to use word “bug” in public messaging for 1.4 release. Opinions on changing Decred’s ticket from DCR to CRED. Criticism of the use of “lifeless corporate” style in announcements. TabConf in Atlanta, USA. @joshuam noted: “Tabconf was awesome. Extremely engaged audience — best questions I have received at a conference to date”. Talk in UAEM University in Ecatepec, Mexico. @elian shared: “I spoke about the history of money, the Internet, Bitcoin’s blockchain, Decred’s hybrid blockchain and how to work in the cryptocurrency & blockchain industries. They were fascinated by the innovation of cryptocurrencies and blockchain, both students and teachers. The audience was mainly composed by computer science students. The main questions went around what is money, how to value cryptocurrencies and what are the potential work opportunities for fresh grads in the industry. (…) Doing talks in universities is a big deal for me because I know that the next generation of devs, lawyers, accountants, etc, that will be working on the industry is there and they are eager to know more about what opportunities this industry brings. Teachers were very excited to have this subjects presented to their students because is not easy to get such high tech talks to universities that are not in the centre of the city.”. The Next 10 Years: Crypto Boom, Bust, or Buidl? in San Francisco, USA on Mar 12. Organized by Decred and OKCoin. CEO of OKCoin Tim Byun, Decred’s Jake Yocom-Piatt, Chris Burniske and Alex Evans of Placeholder will talk about Decred and the future of cryptocurrencies. Restoring Trust through Blockchain Governance in Toronto, Canada on Mar 16. Crypto Conference 2019 in Berlin, Germany on Mar 27. The event is part of Berlin Blockchain Week. @karamble will talk “Adaptability in Digital Currencies”. Jalisco Talent Land in Guadalajara, Mexico on Apr 22–26. Contact @elian for details. As noted in Governance above, stakeholders approved a $200K budget for 2019 events, which includes a strong presence at 3 large scale events and attendance at a number of smaller events. Decred mentioned in Forbes and Breaker Mag stories. Decred Journal — January 2019 in Chinese by @guang (also Dominic, Hugo and Jill), in Spanish by @elian. Thank you! Telegram communities: Chinese 866 (+53), Italian 160 (+28), Portuguese 642 (+100), Spanish 73 (+11). article by Yin triggered another community member to write more about dcrtime and create a web UI for timestamping files and raw text (UI for dcrtime is tracked in this issue). non-English chat rooms were renamed after languages used in them for consistency, unused rooms were removed. #chinese, #portuguese, #russian and #spanish are now available in Matrix. Riot client was upgraded to version 1.0 with a reworked UI. Another Reddit thread was deleted after receiving some discussion. Moderators have no power to forbid this destruction of community knowledge, except the workaround to resubmit the deleted thread. Ideas for more persistent Reddit-like forum are collected in this issue. “Decred’s community spaces — a crude analogy” post by @richardred compares multiple comm platforms used by the Decred community. The follow-up discussion noted problems of keeping up with chats, the importance of having a vibrant Reddit community, and issues with proposal discussions outside Politeia. In February DCR was trading between USD 14.97–18.28 / BTC 0.0042–0.0048. The average daily rate was $16.51. A study of Monero nonces documented differing patterns in the nonce distribution when ASICs were mining on the network, it considers the methods ASIC miners may take to disguise their presence and how they can be detected. The study speculates that 85% of the Monero hashrate comes from ASICs at time of writing. A Grin developer published a forum post expressing disappointment that a request for donations to fund one of the developers had not been filled after two weeks of the network being online — and threatening to take 20% of the block rewards to fund development. After the news spread, the campaign quickly raised EUR 67,580, surpassing the EUR 55,000 target. As Breaker Mag noted, Grin “attracted tens of millions of dollars in mining investment, but had some trouble raising a mere $62,000 to pay its lead developer for six months”. We have noticed a lot of trolling and shills on both sides of the debates from anonymous accounts on forums, youtube, telegram, gitter, reddit and twitter. There is no way to know if these accounts are real people who actually have economic stakes in ethereum, or are simply fake troll or shill accounts funded by one side of the debate. Tezos started voting for the first amendment to its protocol on Feb 25 (simple guide, detailed guide to amendment process). The amendment process has 4 phases, each lasting 8 “cycles” (a cycle lasts around 3 days, so each phase lasts for around 24 days). In the first phase bakers submit and upvote proposals. There are 2 proposals being evaluated now in the first phase, they both increase the gas limit but one also decreases the minimum “roll size” (amount of XTZ required to be a baker). It is interesting to note that Kialo is being used by some Tezos community members to discuss these proposals. When the first phase ends, the most upvoted proposal will progress to phase 2, where it must be approved by at least 80% of bakers. If the criteria are met, this is followed by a testing phase in which a testnet fork with the changes applied is created and runs for 48 hours (a further testnet matching the proposal may be run for the rest of this phase to allow further testing). After the testing phase, bakers vote on whether the changes should be activated, with an 80% supermajority required. After this 4th phase the changes are activated (or not) and the cycle begins again with new proposals. Dash v0.13.1 was released on Feb 8 to “accelerate adoption of the Dash Core v0.13”. Dash Core v0.13 was intended to activate DIP3 but it had an activation threshold of 80% blocks signaling support from the PoW miners and masternodes in a 7 day window before activation would begin. After failing to meet these criteria for around 24 days, it was decided that the criteria are too stringent and that the requirement for masternodes to signal could be dropped. When enough PoW miners adopt v0.13.1 the change would activate one week later (it activated around Feb 26). 0x protocol (ZRX) held its first token holder vote between Feb 18–25. The vote was to approve ZEIP-23 and enable “trade bundles of assets”. The proposal was approved with 99% Yes votes by 5,061,033 ZRX (0.86% of the circulating supply). The NEM Foundation’s funding proposal started voting on Feb 15 and voting was open for 5 days. The funding proposal passed with 90% Yes votes and 10% No votes — with votes from 4.56% of the “Proof of Importance” (NEM’s way of weighting holders’ influence). The vote was conducted on the basis that a 65% supermajority of Yes votes was required, and at least 3% of the network’s POI must vote Yes as a quorum requirement. Voting was conducted from within the NEM wallet by sending 0 XEM transactions to a Yes or No address. Another concurrent proposal to fund “NEM Labs” was also successful, with a similar level of participation and 98.8% approval. The NEM Foundation proposal asked for $8 million in XEM (figure is surprisingly hard to find, could only be found in a google doc presentation), while the NEM Labs proposal asked for $3.27 million. The Aragon Transparency Report for Q4 2018 was released. This report presents a detailed breakdown of spending related to the project. The total spent in Q4 2018 was ~€1,055,484.43 or equivalent in cryptocurrency, with €268K on salaries, €330K on payments to service providers, €45K on sponsoring/tickets for events, €63K on hosting the AraCon conference and €260K on Nest teams (a grants program). This report also describes financial hedging steps which have been taken by Aragon Association — exchanging some of the ETH raised during the ICO to buy other assets. The blacklist issued by the EOS Core Arbitration Forum (ECAF) in Jun 2018 was allowed to lapse when a new Block Producer was rotated in which had not configured the blacklist. This allowed one of the blacklisted addresses to move over 2 million EOS. The lapse occurred because the blacklist has been implemented as a list of addresses from which block producers will not process transactions, with each block producer being responsible for maintaining the blacklist manually. If only one top 21 BP does not have an updated blacklist, blacklisted accounts are vulnerable to being emptied. One solution that has been suggested is to “null the keys” until a decision has been made about what to do with the frozen funds. What to do with the blacklisted funds is already an issue for EOS, and the ECAF itself may be disbanded if an open referendum to “Delete the ECAF” passes (currently on 99% Yes with 2.4% of EOS having voted). Binance is launching its DEX based on Cosmos’ Tendermint protocol and DPoS. The listing fee will “probably be close to $100,000” to “reduce the number of spam or scam projects”. In contrast, Decred’s DEX design has no listing fees and doesn’t require an extra blockchain for its operation. Canadian exchange QuadrigaCX owes its customers $190 million. The funds reportedly cannot be accessed after its founder died, who had sole control or knowledge of exchange’s cold storage solution. Another $500K in BTC were locked “by mistake” per this story. The never ending trail of failures by centralized exchanges shows just how challenging the custody of cryptocurrencies is. Medium showed its power again by suspending the account that posted chain analysis of QuadrigaCX wallets. Luckily, someone made a snapshot. The suspension hides all account’s content and is implemented as a redirect to a same-for-all page that says “This page is unavailable” and does not state the reason. Medium is a powerful platform, but at its core is a centralized service that can lock in data of those who don’t make backups. Earlier behavior like this triggered a discussion about migrating from Medium or treating it as just a mirror. Android malware was discovered on Google Play Store that changes cryptocurrency address in the clipboard. Always double check the address before sending. Credits (alphabetical order): bee, davecgh, degeri, Dustorf, emiliomann, guang, jholdstock, liz_bagot, matheusd, raedah, sambiohazard. Special thanks to richardred for extensive review of the crypto governance space, and to saender for abstract art images.